0:05Skip to 0 minutes and 5 secondsSIMON KEAY: But we've also found quite a lot of human skeletons. We've found nearly 50 of them. 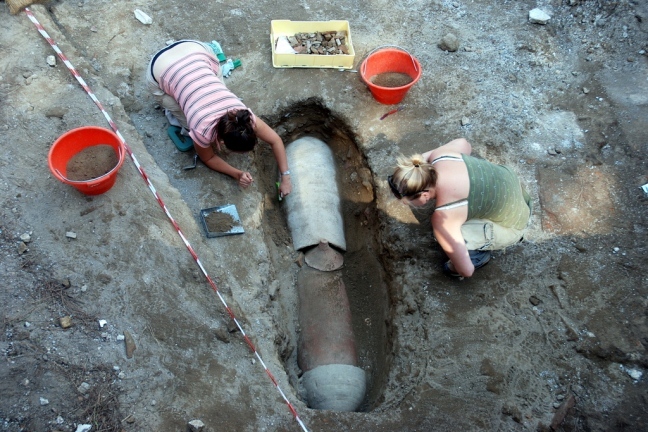 And we're doing-- our Italian colleagues are doing some very interesting anthropological work on those. And that's starting to tell us something about the people. What they were like physically. Heavily male population. Very heavy carbohydrate diet. People that were very few children, very few women, but people who were engaged in very, very heavy physical activity. 0:38Skip to 0 minutes and 38 secondsFor the people that did you live here, particularly at that time, in the fifth and sixth century, it wasn't an easy life. So, you know, we are starting to get the little snippets of the human story behind everything else. 0:53Skip to 0 minutes and 53 secondsHOLLY WALKER: Were any of them buried? Were there proper graves? Did they have grave goods, or is it skeletons? 0:58Skip to 0 minutes and 58 secondsSIMON KEAY: There are skeletons, and there are skeletons buried quite often in ditches in the ground. 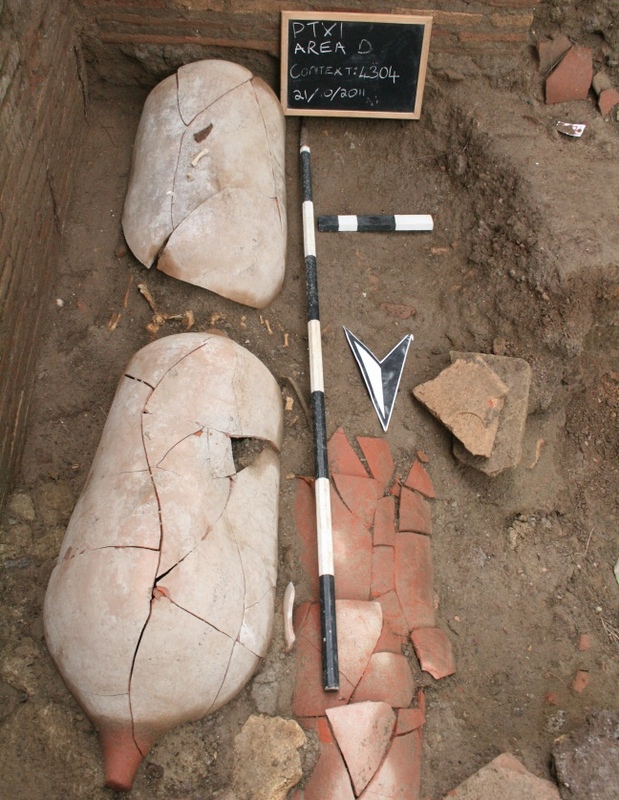 Or there are skeletons buried in fragments of amphorae, like this. At the moment, we're analysing to see whether we can pick out anything which might tell us about their religious background. Because these date to the fifth and sixth centuries. So one imagines that they are all Christians. But as there were Byzantines and Ostrogoths around at that point, they may well have been-- They may have been Arians, or they may well have been Orthodox. We just don't know. We probably can't find that out from the burials. However, my colleagues at Cambridge are doing isotopic analysis on the teeth and on the bones. 1:51Skip to 1 minute and 51 secondsAnd it's possible that we might be able to, by that means, find out something about whereabouts in the Mediterranean these people came from. So, we are starting to find out more. 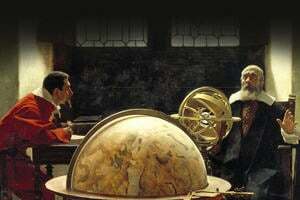 But it's quite a slow process, and we have to use very different kinds of evidences to get the answer. As you have heard previously, although people were central to the life of any port, there is very little archaeological evidence for the inhabitants of Portus. This is true for many Roman Mediterranean ports, aside from occasional tombstones. The discovery of around 43 inhumation burials of late 5th to early 6th c. AD in our excavations, therefore, provides us with a great opportunity to find out more about the inhabitants of the port. 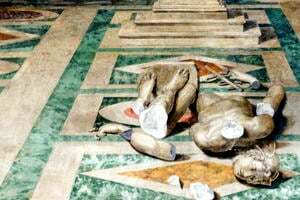 Burials found in Ostia, such as the 100 burials dating between the 5th-9th centuries by the Pianabella Basilica, provide us important insight into the people living in Ostia at this period. 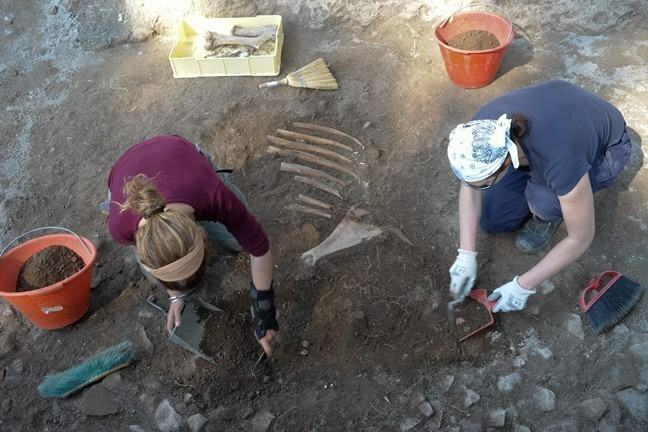 Most of the bone on site at Portus is from human burials from the late Roman period. Burials are usually identifiable in advance of actually finding human bones, but there can also be loose human bones from ancient disturbed burials in any context. Special rules apply to the collection of human bones from a burial which will be closely supervised if it is excavated. The late 5th to early 6th c. AD was a time when, in addition to local port workers and itinerant traders, one can reasonably expect Ostrogoths of Germanic origin and Byzantines from the East Mediterranean to have been present. It is difficult as yet, however, to find evidence for these kinds of ethnic distinction amongst the skeletons from our burials. Standard anthropological analyses points to a predominantly male population involved in heavy physical labour with a heavy carbohydrate diet - a finding borne out from analyses of 3rd c. AD burials nearby. However, in order to try and out more about the geographical origins of our skeletons, members of our team at Cambridge University have been undertaking oxygen isotope analysis of bones and teeth. 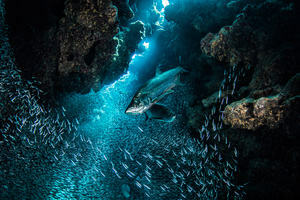 This will help us pick out which of the individuals may have come from south Mediterranean environments, for example, which might suggest African or Egyptian origins. Since the bodies of the dead were either buried in fairly standard amphora or cist graves and were not accompanied by grave goods, there is little about the burial rite that allow us to distinguish differences in religious or social practice.